Q: Lois, what’s the story behind the title of your book? 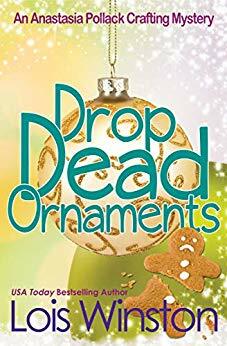 A: Since this is a Christmas-themed story that involves Christmas ornaments and a murder, I wanted to combine the two elements in the title. Thus, Drop Dead Ornaments. 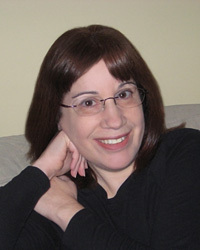 A: Anastasia Pollack is the crafts editor at a women’s magazine. When the first book in the series (Assault With a Deadly Glue Gun) opens, she’s been recently widowed. Her husband has left her with staggering debt, a loan shark breathing down her neck, and her communist mother-in-law as a permanent and unwelcome houseguest. Anastasia is forced to moonlight to earn extra money to keep from losing her home. She’s hampered in her efforts by the dead bodies that appear at regular intervals since her husband’s demise. Although this is a series, and I would recommend reading the books in order, but they can be read as standalones. A: I’m a Jersey girl, born and bred a short train ride from Manhattan. A: Theater tickets. I’d take in a show every night if I could afford to, but I’d need an extra thousand dollars a week for that. A: Being a short commute into New York City. A: We lost power for nine days during and after Hurricane/Superstorm Sandy, but as inconvenient as it was, many people had it far worse. In hindsight, we were relatively lucky. A: When I was nineteen, I backpacked across Europe with a friend. A: Allowing myself to be talked into selling my home and moving in with my in-laws. It was six years of pure hell. A: People who talk incessantly about themselves. A: I should have chosen to go to my second choice college instead of my first choice. A: I’d grab my laptop. A: She’d complain about the mess I’ve gotten her into. She was living a very comfortable middle-class life before I came along. A: Anastasia’s mother-in-law is inspired by my own communist mother-in-law, the main difference being my mother-in-law didn’t own a dog. A: I think Anastasia and I share a common outlook on life, but I’m not about to put my life in danger to solve a murder—except on paper. A: I’m allergic to lilacs and eucalyptus. All he or she would have to do is lock me in a room filled with both. A: The 100 Year Old Man Who Climbed Out of a Window and Disappeared by Jonas Johasson in e-book format. A: Supergirl. I’d love to be able to fly, and some of her other superpowers would be totally cool, as well. A: It would be on an upper floor of a pre-war building overlooking Central Park and have floor-to-ceiling bookcases, not that I’ll ever have enough money for that dream to come true. Do you have any idea of the price of New York real estate? A: My publisher and I had a parting of the ways when they wanted to revert to a boilerplate contract instead of the agency contract that was hammered out for the first three books in the series. I walked away from two additional contracts that were on the table, one for more books in the current series and one for a second series, and decided to go indie.